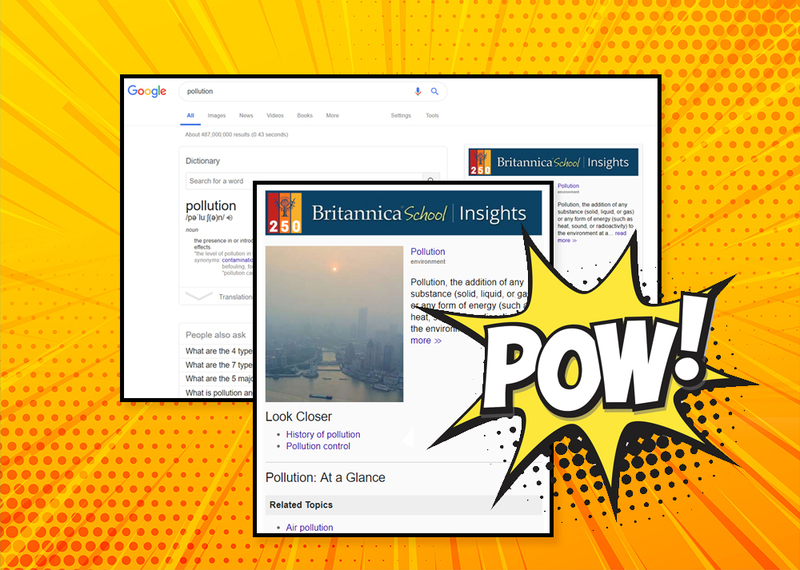 Combat the proliferation of digital misinformation with Britannica School Insights, a free Google Chrome extension that Britannica School users can take with them to safeguard their online searches. Britannica School Insights serves up relevant, rigorously fact-checked information from Britannica School for searches on a wide range of curriculum topics. It then brings this information to the top of regular search results pages. An exercise in media literacy, Britannica School Insights encourages students to look beyond the first set of search results that they see. They are also prompted to compare different sources and to think critically about the origins and biases of information they encounter online. Britannica School Insights is free and readily available for all Australian and New Zealand institutions with access to Britannica School. A 2018 University of Tasmania (UTAS) study on the current state of media literacy in Australian schools has found heightened concerns about students' abilities to critically evaluate the news and information that they consume online. - Uncredited, "Insight Five: A snapshot of Media Literacy in Australian Schools"
Information dilution has become a pandemic. The growing reliance on algorithms and AI to dictate and filter what we see and consume, has led to a digital landscape riddled with biased, polarising, misleading and even fabricated content (Nettlefold, J. & Williams, K., 2018). So much so, the ability to disentangle fact from fiction has effectively become a survival skill for modern day learners. Students equipped with the ability to exercise good judgement when consuming information are likely to increase their potential for success in learning across all levels. Based on responses from 97 primary and secondary school teachers, the UTAS study found an overwhelming majority of teachers agreed that critically engaging with media was very important or somewhat important. Despite the strong consensus, close to a quarter of the teachers surveyed said they rarely turned it into a classroom activity; over 20 per cent feel unequipped to guide students on how to identify whether a piece of media content is true and trustworthy (Nettlefold, J. & Williams, K., 2018). Primary School Teacher (regional Tasmania), "Insight Five: A snapshot of Media Literacy in Australian Schools"
The report further highlights the need for specialised resources and curricula so that teachers are able to incorporate media literacy into their regular classes. Britannica Digital Learning continues our commitment to helping schools bridge the gap in information literacy education through dedicated, curriculum-aligned online resources like Britannica School and Britannica School Insights. If you are unsure about how to install Britannica School Insights, our support team can help. 2. Click 'Add to Chrome'. 3. When prompted, click 'Add Extension'. 4. You may be required to restart your browser. 1. Open your Google Chrome browser and check that you are accessing your country specific Google website. 3. If there is relevant content from Britannica School to match your search keyword, a Britannica School Insights box will appear in the top right corner of your regular search results page. 4. Clicking on any of the links in the Britannica School Insights box will take you to the relevant section within Britannica School. Get full access to Britannica School any time, on any device with a school-wide subscription. Request a quick tour or get started free. Subscribe to our monthly newsletter for more Britannica updates.